Actually, this was the first English review of this great Spanish adventure. Runaway has stood the test of time really well and now it’s safe to call it a classic of the genre. With a third sequel on its way, it turned out being a great hit as well. All hail Pendulo! First published on Just Adventure+ in January 7, 2003. 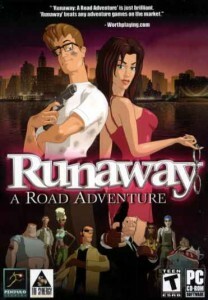 One thing that crossed my mind when I first say Runaway was how refreshing this game is. Refreshing in a sense of being radically different from what the genre has to offer nowadays – where most recent adventures deals with historical or fantasy settings, with a touch of sci-fi here and there, Runaway puts the player in the actuality with a storyline plagued with weird situations, classic villains, a dame in danger and an ancient tribe, paying homage to the classic road movies. And it does it in a very original way. Yes, that’s the word: “refreshing”. Brian never thought that, on his way to California to start a doctorate in Physics, he would end stranded on the middle of the desert, running away from the mafia with a mysterious crucifix and a most er… exuberant lady. He shouldn’t had remembered about that book in a library he ordered a long time ago. He was already driving and the library wasn’t too far away but he could ask them to send the book to him. A decision that took one second but implied safely arriving at California or embarking on the most unforgettable adventure of his life: should he go for the book or not? Luckily (for us), he drives toward the library when, suddenly, a woman appears out of nowhere in front of his car. Thankfully, Brian is a responsible driver and he doesn’t drives fast in the city, so this young lady receives just a minor hit but enough to make her faint. Surprisingly, Brian is a real gentleman and he himself carries the lady to the nearest hospital and stays next to her. As soon as this woman awakes, she starts babbling about some people killing her father while she was watching it, hidden in a corner. Gina, as Brian learns she is called, urges him to help her because those people realized she watched the crime and now are looking for her. That’s why Brian crashed Gina with his car – she was escaping from the killers! 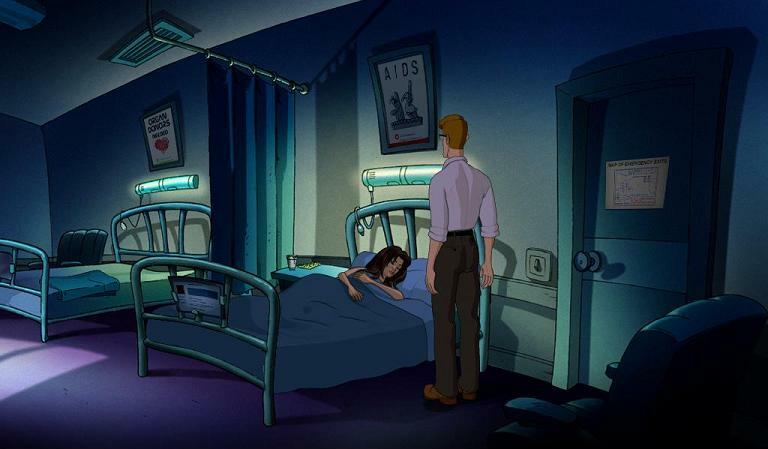 Before immersing in a deep sleep, due to a strong somniferous she is medicated with, she tells Brian that her father was aware of the danger and they had a conversation before the murder. The things gets even more strange because of an odd crucifix he gave to Gina that night. Is she telling the truth or she’s hallucinating? Brian starts thinking that some of her story might be true because he finds out that the crucifix really exists – and that, indeed, it’s very strange and ancient. So, he decides to protect Gina – but he must act quickly as the killers are coming! And so the runaway begins. MIRA, MIRA! TENGO DOS DIMENSIONES! Though at first sight Runaway might look like a pure 2D adventure, one quickly realizes that’s not so true. Actually, all the characters and objects are pre-rendered 3D models using a technique called Non-Photorealistic Rendering, which provides some amazing results. Generally speaking, a 3D object is rendered and then it’s outlined in 2D, similar as recapturing the object using a pencil and paper. For instance, the characters really look like hand-painted graphics but they move very smoothly. You really can’t tell the difference – what you see is a cartoon animated with the most obscene number of frames per second ever attempted. The biggest lowdown is the mouth movements. The lips are animated separately from the 3D model so the developers could do lip-synching for each localized version – otherwise, it would mean a great deal of job rendering all the needed frames again for each language. If we take into account that Pendulo is publishing Runaway in several countries, this is understandable. The result is an awkward feeling each time the characters speak – for instance, in a cutscene you have Brian walking very smoothly and lifelike when he suddenly stays still and only moves his mouth to talk to Gina. It’s very unnatural but it doesn’t hurts the gameplay so hard. It’s mostly visible in cutscenes and even then you get used after a while. Speaking of cutscenes, they’re not on-par with the rest of the game quality – they look fairly grainy which is a bad thing because you feel somehow “disconnected” from the rest of the game. Keep in mind that the in-game quality is outstanding since Runaway boasts a whopping 1024×728 resolution which makes the lavishly painted background scenes look beautiful. Regarding this matter, Pendulo has assured me that the new versions are heavily improved than the one I played, which is the original Spanish one. Still, most cutscenes are very well done and entertaining. A special mention goes for the introduction sequence, quite lengthy and with a truly cinematic feel. 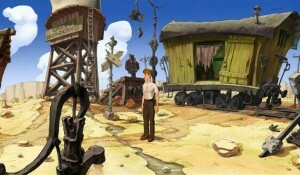 As a bottom line in the visual aspect, Runaway is a huge step forward in 2D adventures and I’d love to see any new title with its style using this technique with the characters – clearly, this will be really big when used in real-time. Pendulo can be proud of designing the best looking 2D adventure yet. 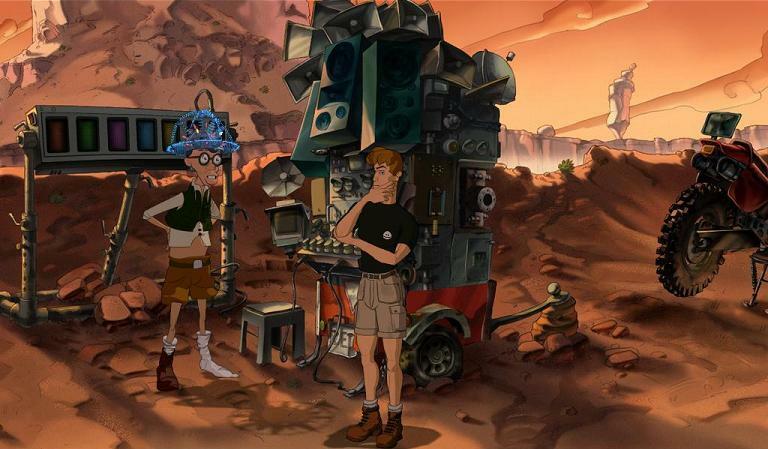 There is one thing I want to make clear: this game has to have the most coolest soundtrack ever heard in an adventure game – I’m serious! It’s a wonderful mix of soft “night” music (yes, it only plays when it’s night-time at the game) and that desolated, western-like tunes. Trust me, it’s so good it could sell a record – actually, an original song was composed for the game which is interpreted by a Spanish band though it has English lyrics. I already mentioned one serious lowdown. Another one is the voice acting which ranges from so-so to simply adequate. I don’t mean they were horrible or unbearable, but it’s a pity in such a polished game. Obviously, I can only speak for the version I played and Pendulo also told me that the voices has been taken care of in the new releases. OSTIA, CÓMO JUEGO A ESTO? Don't worry, he's just trying to contact Trantor - wonder who's the Asimov fan at Pendulo. You will lead Brian through his incidents with a standard point-and-click interface which consists of “examine” and “use” commands. Simple but it gets the job well done. It’s interesting to note that the labels in the lower side of the screen are very accurate in a sense that the game “understands” what you want to do. For instance, if you “use” a painting on a cave-wall, the game will understand that you want to “touch the painting”. Every single operation with objects is customized this way. Sadly, I can’t say the same with the responses Brian gives when you try something wrong – they’re very generic like “I can’t do that.”, “No.”, etc. A couple of times I wanted to yell at him because it had logic what I was trying to do yet he kept telling me he couldn’t without a reason. Only a few responses are customized in a way that makes sense. That said, all the descriptions Brian gives when you examine an object are wonderful and in several locations he will give you a bit of “edutaintment” with some trivia information. Very neat details. Speaking of details, the inventory screen is very nicely done with Brian in a window to the left. If you do something particular with an object, like looking inside a bag, he will kneel and you’ll listen sounds as he roams through the contents. The storyline is the strongest point in Runaway, filled with great locations and characters that will be fondly remembered – the drag queens are not to be missed – although at times it seemed a bit rushed. It’s divided into six chapters with Brian eloquently introducing each one. Yes, the game starts with him telling the story to us so at least we know he doesn’t dies during the trip. Yet something is strange because he looks very different than the beginning of the adventure, like more “cool” – this adds even more to the mystery and it really urges you to solve it! I was a bit disappointed at the beginning because the game seemed too linear but the third chapter turned out to be a pleasant surprise with several tasks and places to visit in any order. Still, Runaway isn’t an adventure with tens of branches – all in all, it’s fairly linear. Like I said before, the story is fantastic. At first, it might seem too cliché but it’s not. The second half of the game gets even more mysterious and a couple of twists at the end are quite surprising. Puzzles are mainly inventory based and generally easy. It’s fairly obvious to realize what it needs to be done in most cases though it’s not that obvious how to do it. When they’re not related to the inventory, a considerable amount of puzzles consists of remembering certain important objects that Brian will not take until it’s strictly necessary. This was a mixed-bag – sometimes it worked but sometimes it didn’t. It made sense Brian not walking around with, say, a ladder without a good reason but it was a bit annoying to go across several scenes again looking for an item that now he was “able” to pick. This is triggered when something new must be done and Brian gives some hint as to what to look for. There were a couple of times where some puzzles seemed unnecessary, like having Object A, that should make the deal, but you must combine Object A with Object B in order to get Object C, which works the same. It kind of breaks the logic that prevails over the game because most puzzles are logical, if a bit on the “McGyver” side – none of them would actually work in the real world but they’re pleasantly satisfying within the gameworld. All in all, Runaway will probably be a romp through the park for most veteran players but that doesn’t means this is a game that can be finished in a couple of hours – some brain-teasers will not allow that. On the contrary, newcomers will be entertained for quite a while. This is what I most liked about this game: it’s very well balanced and never bores. I wouldn’t hesitate to recommend it to any adventure player, be it hard-core or just a casual fan. No road adventure would be complete without an abandoned wagon. So, what we have here? 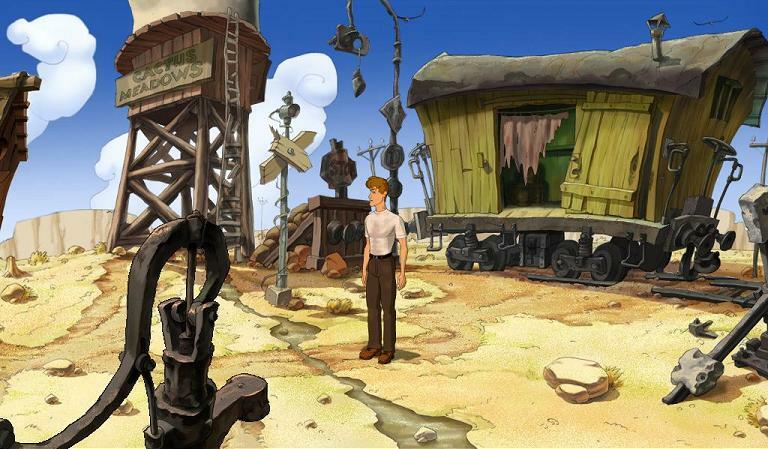 An adventure game with a great storyline, ingenious puzzles, memorable characters, lush hand-painted graphics and an awesome soundtrack. Yes, although it’s far from perfect, this game has it all. 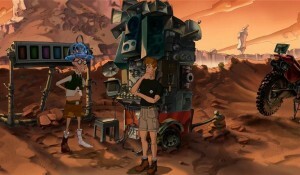 Throughout the years, Spain has offered us some great, underrated gems like the text adventures of AD, La Abadía Del Crimen, an isometric perspective game that made the most of 8-bits computers, Igor: Objective Uikokahonia, from the very same Pendulo Studios, not to mention some great titles from Dinamic, Opera Soft and Topo. Runaway somehow seems like the culmination of it all – it might be the best graphic adventure Spain has produced. I don’t know if it’s a classic – only time can tell if Runaway deserves a place alongside the timeless – but this is the one of the most balanced and enjoyable adventures of these last years.